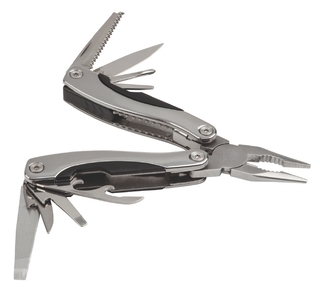 This 13-function multi tool is made with a high-gloss stainless steel handle and implements. It features a secure internal spring as well as a safety implement locking device that ensures the knife, screwdrivers etc. will remain extended until the unlock button is pressed. Available in gloss stainless steel with black trim and supplied in a deluxe nylon pouch.